WikiLeaks also experienced a distributed denial of service attack Sunday, but the site recovered. Washington (CNN) -- After posting thousands of secret government documents, WikiLeaks came under an electronic attack designed to make it unavailable to users, the whistle-blower website said Tuesday. The site also experienced a distributed denial of service (DDOS) attack on Sunday, just as it was publishing the first of what it says are 250,000 secret U.S. diplomatic cables. Such attacks normally are done by flooding a website with requests for data. "DDOS attack now exceeding 10 Gigabits a second," WikiLeaks said on Twitter. The effects of Tuesday's electronic disruption were unclear. WikiLeaks recovered from Sunday's disruption and began publishing cables from U.S. embassies around the world, documents that the website said represented the largest-ever disclosure of confidential information. 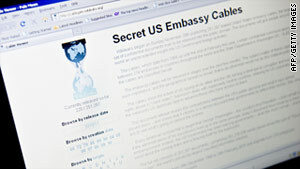 Those documents give the world "an unprecedented insight into the U.S. government's foreign activities," the site said. WikiLeaks drew widespread condemnation for publishing the confidential cables that in some instances, detailed with unusual frankness Washington's diplomatic interactions with other countries. On Tuesday, the documents' disclosure continued to reverberate around the globe. The French president condemned the publication as U.S. Secretary of State Hillary Clinton began meeting face-to-face with leaders from several countries mentioned in the documents. "I, of course, have been reaching to governments and leaders around the world over the last week. I will continue to do so," Clinton said in Astana, Kazakhstan, the first stop of her four-day trip to Asia and the Middle East. "As I said before I left Washington, we consider it regrettable that information that was meant to be confidential has been made public," she said, "and I particularly worry about the human rights activists, the religious leaders, the critics of governments who speak to members of our embassy about abuses in their own country, whose name may either be in a reporting cable or who may be identifiable because of the description of the person. In Kazakhstan, Clinton has to deal with the fallout from a 2008 cable from a diplomat in the U.S. Embassy, which began with this line: "Kazakhstan's political elites appear to enjoy typical hobbies -- such as travel, horseback riding and skiing. Not surprisingly, however, they are able to indulge their hobbies on a grand scale." The cable goes on to present a tale of lavish living, including a six-figure sum for Elton John to sing at a birthday party and a palace in the United Arab Emirates. As Clinton sought to soothe ruffled feathers, the French government blasted WikiLeaks. François Baroin, a spokesman for French President Nicolas Sarkozy, said on French television Tuesday that WikiLeaks showed "the highest degree of irresponsibility." One of the published cables provided this description of Sarkozy: "An activist on the international scene, with an opportunistic eye for grabbing attention and credit, Sarkozy will remain a challenging partner despite his desire to improve the bilateral relationship." Some news outlets have reported that U.S. diplomats called Sarkozy an "emperor with no clothes." Japan's Foreign Minister Seiji Maehara called the WikiLeaks disclosure "a monstrosity and a criminal act." The Turkish president, however, downplayed the significance of the documents, though they revealed a difficult U.S.-Turkish relationship centered on Washington's anxieties that Turkey is marching down an Islamist path. "None of this can hurt our aim to make Turkey a stronger country, to develop Turkey, the importance we give for political stability in Turkey and our valuable friendships," President Abdullah Gul said Tuesday. "There are certain things being said about the prime minister and me," Gul said. "These are things that they evaluated and wrote based on their perspectives. These may create distrust, but these are normal. They can happen." Diplomats worldwide were scrambling to assess the severity of the disclosures. Clinton, however, expressed confidence that U.S. diplomatic efforts will survive the leak of the documents, whose authenticity she would not confirm but which lay out in detail the diplomatic sausage-making that is usually hidden from public view. "I can tell you, in my conversations, at least one of my counterparts said to me, 'Don't worry about it; you should see what we say about you,' " Clinton said. "I would hope we would be able to move beyond this and back to the business of working together." But she added, "The United States deeply regrets the disclosure of any information that was intended to be confidential." On Sunday, a computer hacker who calls himself "The Jester" claimed responsibility for the cyber attack that affected WikiLeaks. The Jester, who describes himself as a "hacktivist for good," said he took the controversial site down "for attempting to endanger the lives of our troops, 'other assets' & foreign relations." 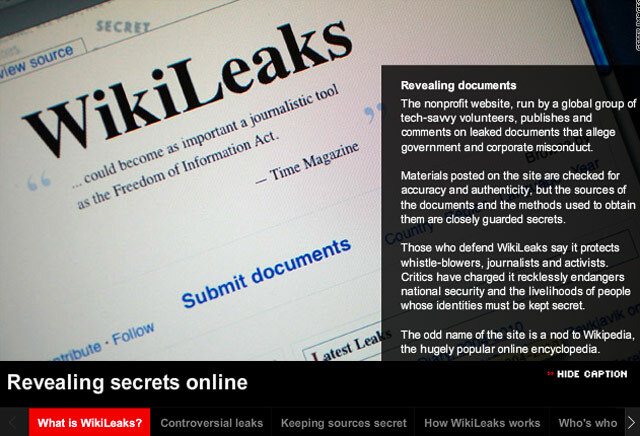 WikiLeaks said in September that it had prepared an unspecified "insurance policy" against its site being taken down. In addition to being published on WikiLeaks website, the classified documents were acquired in advance by five major newspapers in Europe and the United States (The New York Times, The Guardian in Britain, El Pais in Spain, Le Monde in France and Der Spiegel in Germany). CNN declined a last-minute offer to discuss advance access to some of the documents because of a confidentiality agreement requested by WikiLeaks that CNN considered unacceptable. CNN is committed to carefully and responsibly reporting on the documents already published by WikiLeaks and the five newspapers, focusing not only on what the leaked documents say but on what their publication means for global relations and U.S. diplomacy.